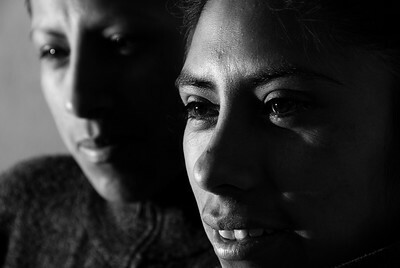 In einer kleinen und feinen Portraitserie präsentiert ENLUMEN Gesichter von Menschen aus Bolivien und Argentinien. Die Besonderheit dieser Reihe ist der Konnex des Menschen zu deren Umfeld und der Einsatz von weitwinkeliger Brennweite. Dem Betrachter erschliesst sich somit die zum Gesicht gehörige Landschaft und er kann Mensch und Lebensraum zu einer Einheit zusammenfügen. Einen tieferen Einblick in die „Gesichter einer Reise“ wird das geplante Buch darüber geben können. 23. of March. Day of the sea. March, 23rd is a special day in Bolivia since 1879. On this day Bolivia lost the province Litoral to Chile. The loss of a province is not really a problem for this country. Bolivia has been double the size. Nevertheless, the province Litoral was the only access to the sea. At the anniversary the military arrays in enire Bolivia and the local authorities conjure the Bolivian people that their country would be so much better if they only had access to the sea. As simple as that. 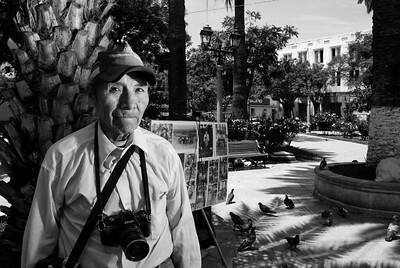 Cecilio Arist Choque, photographer on the plaza de Municipio in Tarija. 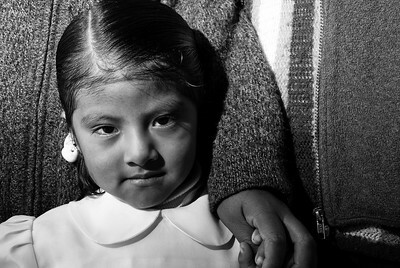 He is doing this job for 20 years and is almost part of the works of the Bolivian photographies. I met him three years ago. He meant to convince me that my camera could contribute to the history of photographies significantly more in his hands. I even rejected the attractive offer of trading my digicam against his 30 years old russian make. He told me about Bolivia, which he knows. 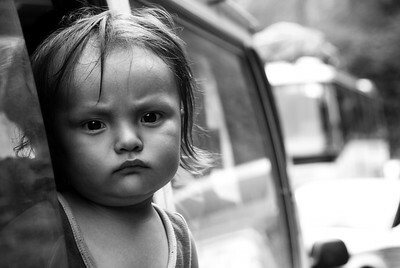 This is a country of suffering, hardship, passion and of revolutions. 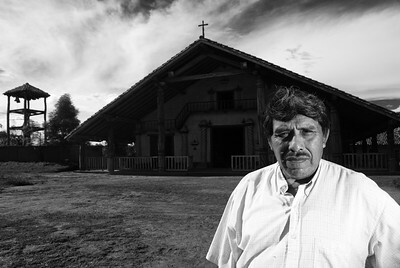 His home is Macha, a village upwards of 4500 metres between the mine stronghold Llallagua and the most southern province Tarija. The region is as wild as its inhabitants. Jugement is pronounced by the people themselves. If the state is of a different opinion then it is being fought against. 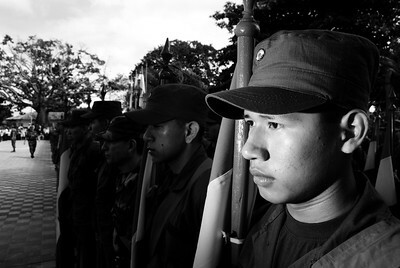 Insurrections are being raised in this region time and again and the military attempted to crush the revolts – but without success most of the time. In Bolivia there will be found enough causes for a riot, justified causes! Cecilio fought himself. However, now he feels to old for it. It is Saturday morning and we are in Cochabamba and Want to go further to La Paz. We stayed at the place of some people´s family for two days. They are Jehova´s Witnesses and will preach door-to-door. “ Do you not get sent away?” „ Of course, but this is nothing in comparrison to what the Lord did for us!” Sure! Anyhow, I am still glad to have met the three and to have spent a short period of my life with them! 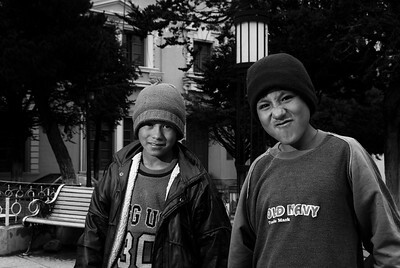 Chabotes, children who clean shoes in Potosi. They are skilful concerning the initial business contact and its execution. One person claims that Chinellas need to be polished more than others. Brushes and cleaning cloth skyrocket one meter just to land exactly in the hand of the artist of the shoe beauty treatment. The devices glide in one go over the flank of the shoe. Impressing! The brushartists on the picture are Wilbur, 8 years, and Santiago, 9 years. “Are you attending school?” “ Yes, to the evening classes” If this is true? Potosi keeps surprises for me. 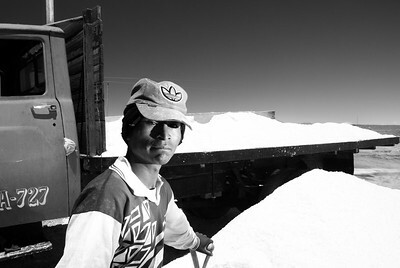 Franco who ist he son of Jose, a coca dealer at Mercado de Uyuni, I met three years ago. Even back in the days Jose wanted to leave this cold and rough place. Tarija, which is situated 400 km more southern and 2000 metres baser is more attractive than Potosi. 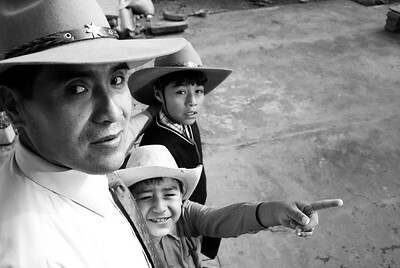 Now, Jose and his family are still here and Selling coca is a profitable business. This ist the OBI, the ZGONC and of the Mineros. You get coca, snapps and dynamite. Nothing else! The nice gentleman on the photograph sells us his entire range of goods and we are prepared to enter the mines des Cerro Ricos. Cerro Rico, the rich mountain, Cerro Rico, vital nerve of Potosis, Cerro Rico, the battlefield, Cerro Rico, a synonym for wealth. In 1545 a shepard discoverd silver on the “Cerro Rico” incidentally. The Incas who ruled the country bevor Columbus and Pizarro- the Spanish conqueror- knew about the wealth of the mountain, but as an oracle told them, this prosperity had not been intended for them, but for the Gods that would appear. The Gods did come, Spanish speaking Gods with a boundless voracity for precious metal unscrupulously giving in to it. Potosi had been a one-horse town until then with a few houses only. Who would want to live 4000 metres aloft in the cold and with thin air? But all of them craved for a slice of the silvercake. The cake was the Cerro Rico, initially cut by the indigenous people and slaves and eaten by the Spanish. In 1610 Potosi had 160000 inhabitants and was one of the biggest cities of the western hemisphere. The price for the precious metal was vast. According to Eduardo Galeano in “The open veins of Latin America” about six millions of people lost their lives at the Cerro Rico. However, the Cerro Rico is almost bled to death. The mountain seems like a battlefield. 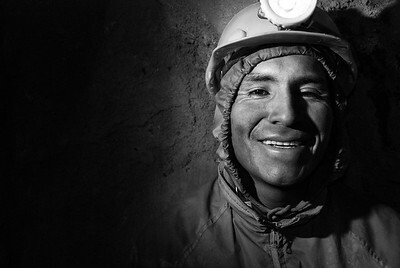 Still the mineros go into the mines like Adolfo. Together with six people he founded a cooperation. They are digging tin, zinc and sometimes silver. One hour later we are bound for the mines. We move partly crouched, partly on our hands and feet. We met the cooperation of Adolfo and his six collegues. One of them is only 16 years old. He is the youngest. 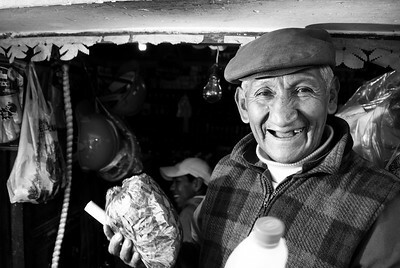 Our drinks and coca change the owner And the mineros are talkative. Potosi has developed during the past years. Adolfo sells us a stone for ten. Actually it is said to be worth a hundred. Yes, we know! I bought it nonetheless. The price for mineral ores has risen worldwide and this has a direct effect on the content of the wallets of the mineros. What if the price drops again? This man I will never forget, particularly because we were lucky to experience him and his life for one week. 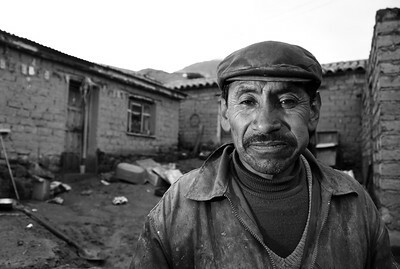 Don Lucho is a bricklayer in Potosi, he has six children and is married to Donna Juanita for a period unknown to me. We were basically “kidnapped” from our accomodation that we had paid in advance and were “forced” to reside in the noblest room of the house. It has been an honour for us. The cooperation of Adolfo is satisfied. 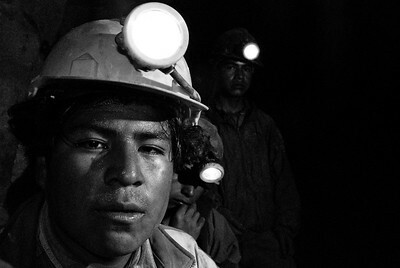 The work is hard, but one is earning more than the average Bolivian person. There are up to 40 degrees Celsius inside the mine and it is pitch-black. Some boast the stone and others carry the rock with small wagons outside. Uphill one has to pull and downhill all cling to the wagon. One better not stand in the way on the tracks! The mineros are familiar with their way, but what if we lose our guide!?! 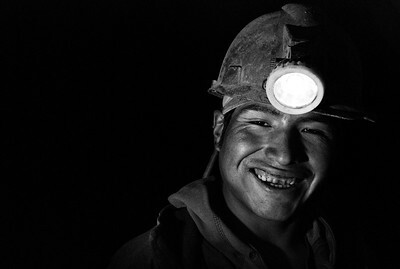 The Cerro Rico probably is the most inhospitable working place in the world, but the mineros can deal with it, and if not, the alcohol of 96 % helps a little. „ Hey, Gringo! Photograph costs 20 Bolivianos“ . „Deal!“ And this ist he result! The Salar de Uyuni is 1200squarekilometres big and is situated on a sea level of 4000metres. Besides salt mining which is not really working properly, there is tourism. The Salar de Uyuni is unbelievable. Unbelievably huge, unbelievably beautiful. Whoever lives less than 5000km away has to take exertions upon oneself to see it! Adventure! If possible fast! 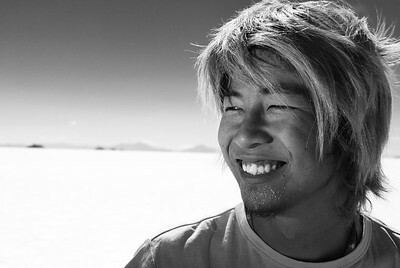 The photographed man from the far East attempted to negotiate the route from San Francisco, California to Buenos Aires. By motorcycle. His goal was already within his grasp taken he had long arms. He is not aware that the path before him has been swamped... When we were on our way back from our trip he came towards us. Beside the salt lake and on a firm track. He knew when he had to turn! The jeeps with the tourists take a short halt, people jump outside , take a few photographs and continue their journey. What is it that remains, exept for a few bolivianos that one has got thrusted into the hand from one or another tourist? Half a boliviano is worth such a pile, like one can see backwards. 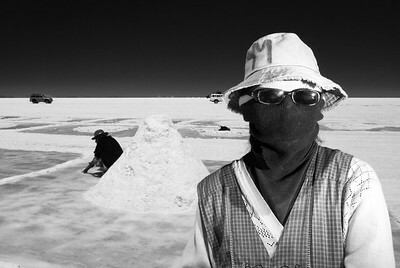 The saltworker is muffled up partly because of the intense solar radiation, partly because of the wind and the cold. A photographer is a photographer. 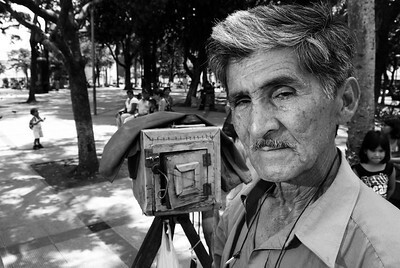 But Filemon Vargas, aged 72, is taking photos of a different sort. Behind all this is his camera and dark room in one. Whoever works like this, deserves attention. He got it fromm e! He does not use negative films, only photographic paper. The shutter release is only the cap of the lens which he takes down for five seconds to expose the paper. That is how he did it every Sunday at the Plaza de 24 de Septembre since 1951 in Santa Cruz de la Sierra. 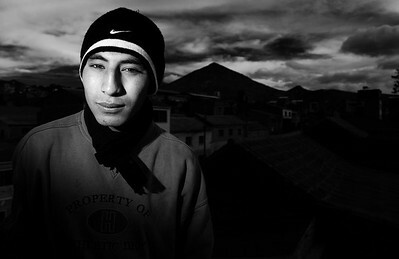 All micros- this ist he name of the chapas in Bolivia- have to stopp. We have to wait because a mud flow obstructs the street. It has been caused by the heavy rains of the last days. Getting off means dirtying the entire clothing in the foot area. Nonetheless, I got off. Curiosity is the nicest form of greed and had to be satisfied. The young one evaluates the situation sceptically like us. Will we get through?